Spent a good amount of time reviewing other upgrades and I gotta say there are some sweet looking (and likely sounding!) systems people have built. I'm going to go a similar route too, but the goal to augment the existing HU sound capabilities with external components. No aftermarket HU can support both Backup & Lanewatch cameras. Each are tied into the B-CAN system and the OEM HU is uniquely coded to handle the processor of the Honda B-CAN. Now I must give many thanks and kudos to Ducttapemaster for having the balls and the know how to take apart the OEM headunit to get this info! It uses a TDA7851F 4 x 48W MOSFET Quad Bridge Power Amplifier. This chip is fairly efficient and is what I would expect. Be aware that the specs specify that the amp is rated at 28 watts RMS per channel @ 4 ohms. EDIT: Each speaker in the doors and tweeters are rated at 4 ohms each. 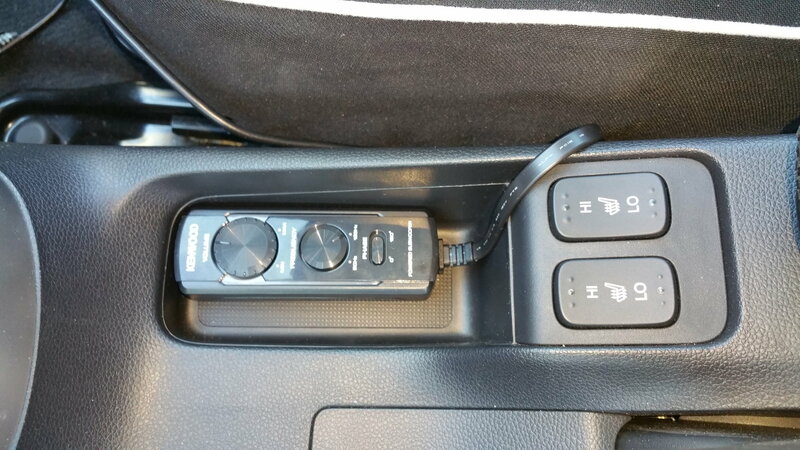 The front left and right have their own L/R channels as do the rear speakers. There is a pass high pass filter built into the tweeters which takes the front L/R channels full range and crossover to the tweeters. The impedance of the tweeters would be higher as a result so it does not present too much additional load with the 4 ohm front speakers. 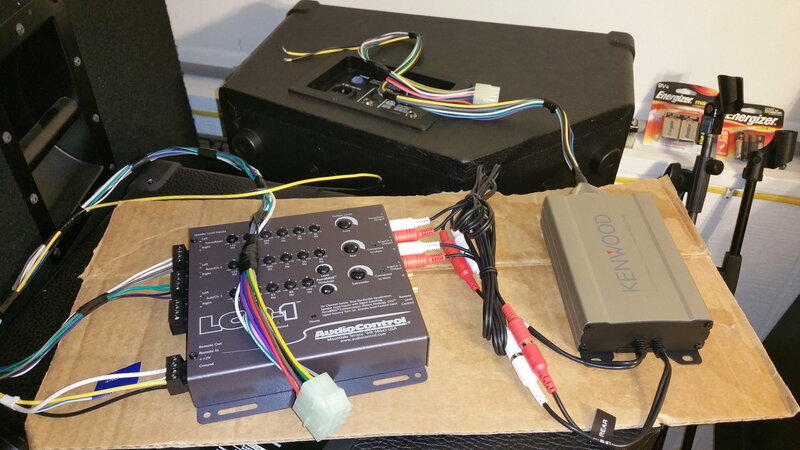 First step to the upgrade is to create a non-invasive wire harness for the stock HU but allow for expand-ability for external amps, subs, etc. 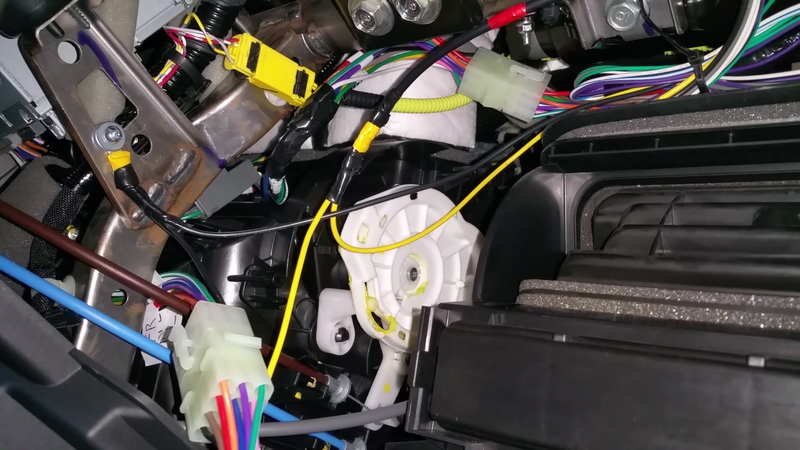 thank you to fibrepunk for providing great instructions to populate aftermarket adapters with all the wires needed to retain all OEM functions and allow expansion with aftermarket components without cutting the stock harness. I also hope to collaborate with Ducktapemaster with other splice harnesses to unlock the full features of the HU in the future! The weakest link from the get go is the lack of bass response, THERE IS NONE! Can't expect much from 6.5" speakers, at 24-30 watts, or even 50-60 watts. You need a sub! I cannot confirm or refute the HU has a steep bass frequency rolloff to prevent distortion of the speakers. I CAN confirm that there is nothing in the diagnostic menus to disable such a feature. That would lead me to assume that there is no high pass filtering/low cut EQ being done. Not to leave this variable to chance, I plan to use this device. Its an AudioControl LC7i mean to compensate for any roll off of bass, and an easy interface to pipe HU output to an external component sub-woofer. It will handle the 4 door speaker channels plus the crossovered tweeter channels which is done internally at the HU. I can sum the front and tweeter channels to a full range output on the LC7i. This gives me the max flexibility if I decided to add larger external amps later on. The LC2i is a basic unit for just one channel and would be great just for a subwoofer addition, but limits my upgradability down the road. The extra cost I can justify. Normally I prefer matching an enclosure to a speaker, not the other way around. Google Thiele and Small parameters. This is about as technical as audio gets besides enclosure design. 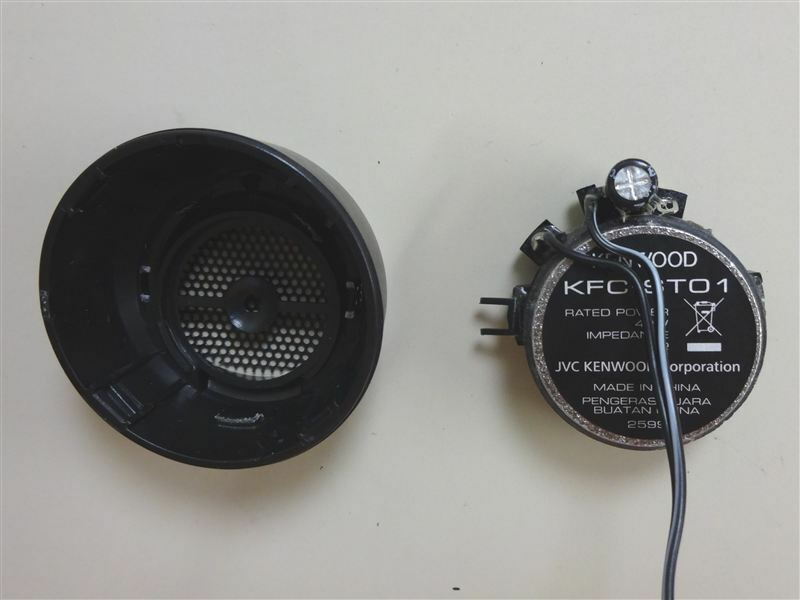 For simplicity purposes, the Kenwood speakers are high sensitivity (92db @ 1 watt) for their wattage range of ~30-40 watts. It gives me the volume output I want, and coupled with a component subwoofer the sound should be rounded out well I anticipate without replacing the OEM amplifier chip or using external power amps. The final thing I need to research is to make sure the Kenwood sub fits under the front seats. I'd hate for it to interfere with foot room (but very few people sit in my back seat anyway) or more importantly the magic seat for when hauling cargo. Hope this helps others. I will be posting in the following weeks on installation notes. Those that know of me can expect pictures, videos and various media to guide others if they wanted to tackle a similar upgrade. Cheers! thank you to the forum members for the knowledge base! Last edited by Bassguitarist1985; 10-07-2015 at 01:29 PM. Just a quick interim update. 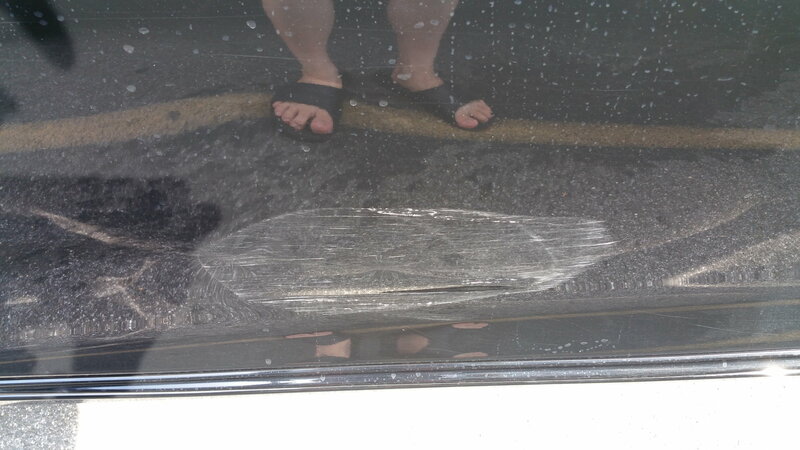 My car got hit by a drunken idiot, and now its at the body shop being repaired. The good news though is I ordered the audio components while I wait. Door inner skin and water shield removed. 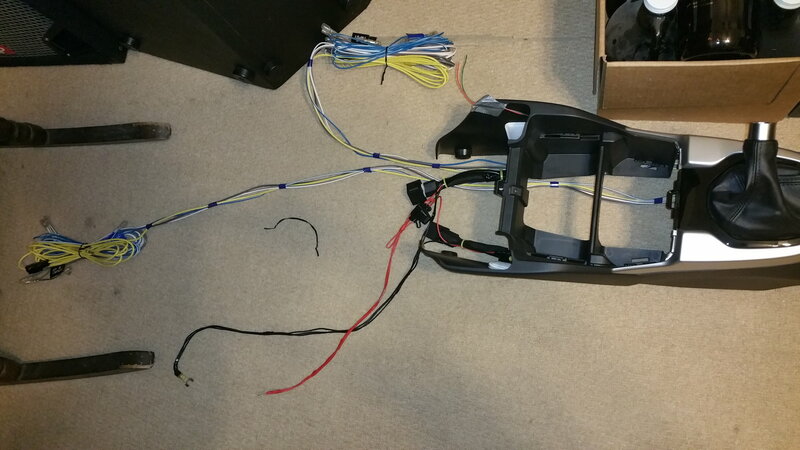 The red/black/yellow wires are for my heated side mirrors and LED winkers. Now I have concidered putting dynamat or some kind of sound deadner in the doors, but I do not think thi will make much difference at the power level I am designing my system around. I never thought the road noise of the FIT was too overbearing. I also decided to go with two Kenwood KSC-SW11 subs. 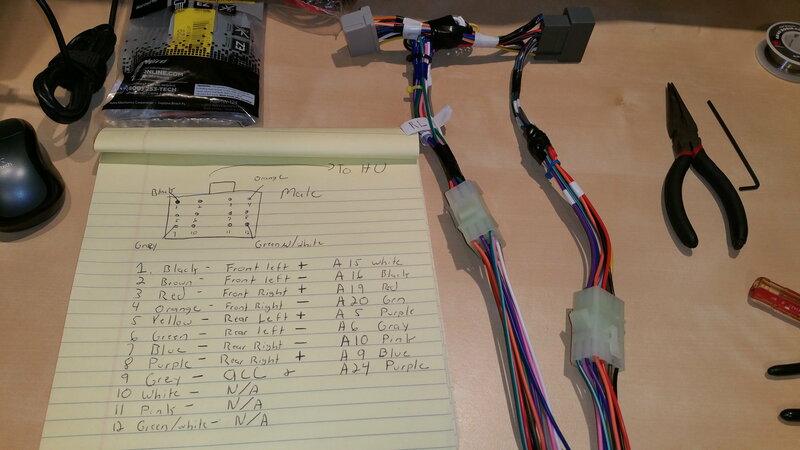 I am already working on a method to use one remote control harness to control both units simultaneously. 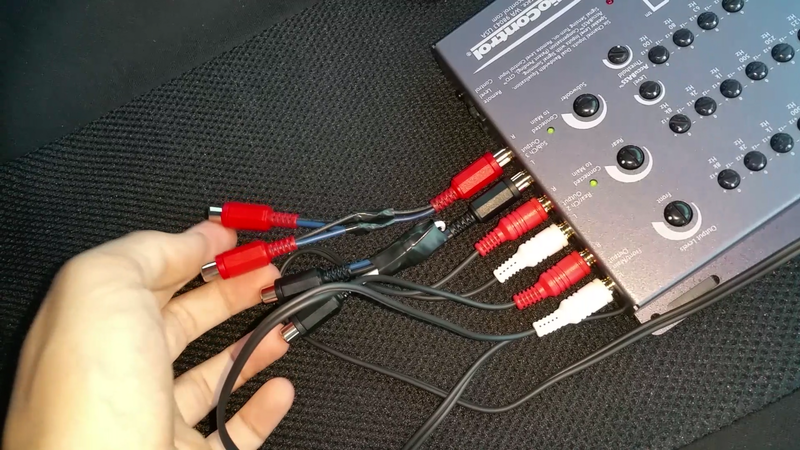 While Kenwood's CS doesn't recommend it, they did confirm that using a RJ12 straight Y-splitter would work. IDK the validity of this, will confirm once I get it. The worst case is setting two individual remotes and leaving them hidden out of the way. Using the proper molex connector removal tool I have been able to populate a full male/female connector set for the HU interface. I'll have pictures on this soon. I have also designed in a Y-splitter for the speaker outs with 10 pin molex connectors. I can use it as a pass through using the stock HU amp and interfacing the LC7i. I can also use it to bypass the speaker outs to the LC7i, but then route the speaker outputs to an external amp if I so chose to. I know, pictures will help. They are coming soon! Last edited by Bassguitarist1985; 10-07-2015 at 01:31 PM. Already ahead of you! The tweeters were the first components to arrive in the mail today. Should have the rest today or tomorrow. 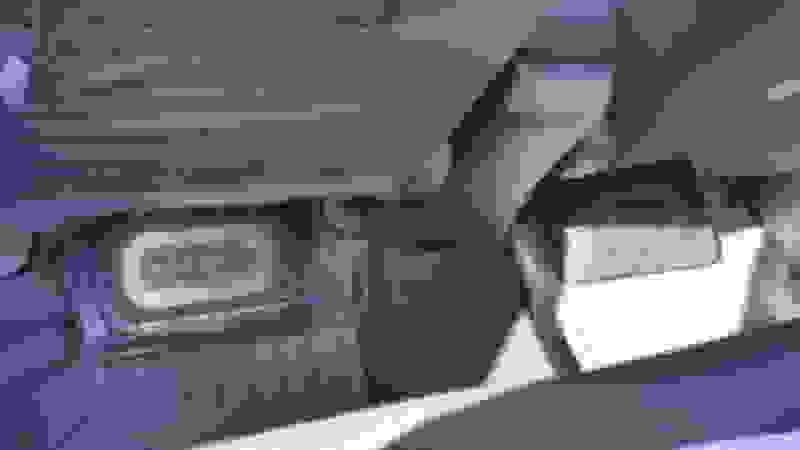 You can remove the tweeters from their black plastic housing fairly easily. I should have my car back today from the body shop to look at the tweeters see how they are mounted on the stock garnishes. Obviously wont be an exact fit, but I believe some hot glue (aka hot snot) will work very well if i decide to mount them underneath the garnishes to appear stock. Then again I don't mind having the tweeters mounted above the garnishes via 3M double sided tape, just need to route the wires inconspicuously through the garnish without drilling or dremeling anything. The other thought is these tweeters have an angle to them with the housing. this may or may not enhance the position of the front sound stage. 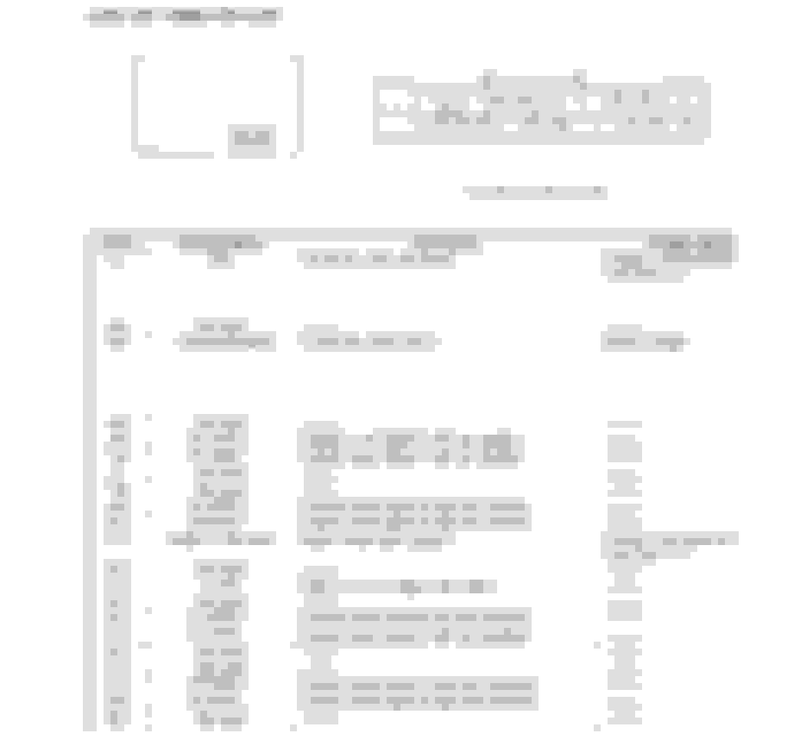 Last edited by Bassguitarist1985; 09-24-2015 at 09:53 AM. Installed the Kenwood 6.5" speakers in the doors yesterday. A few installation tips. I'm editing down a video of the install too. Wiring was a snap. 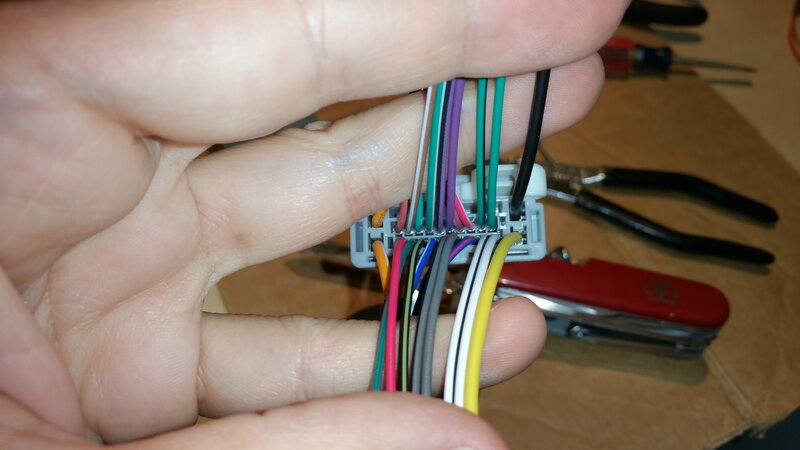 You cannot mix up the wires as the terminals are different sizes. 1. The self tapping screws the speakers come with are too long. You need to either get shorter screws or snip 3 threads off the one it comes with. If you dont then the screws will hit the metal and push the mounting ring away from the door. 2. 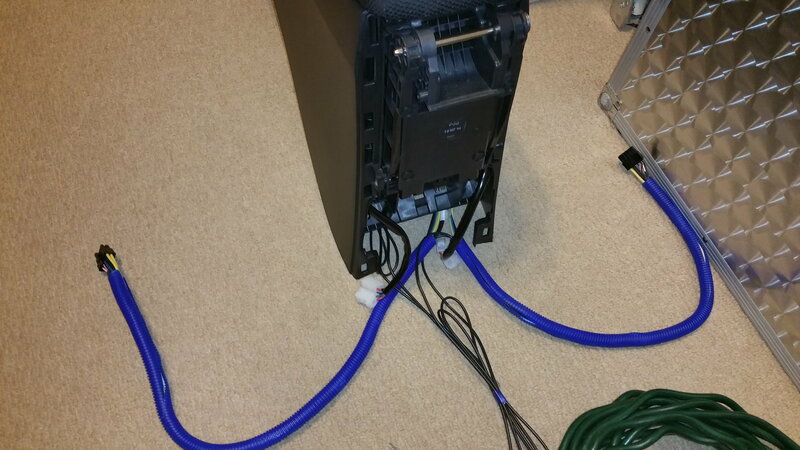 Save yourself grief from any rattling issues and add some foam tape around the mounting ring. It seals the ring to the door, and no annoying vibration sounds. 3. The Scosche rings are NOT an exact fit, but they do fit with persuasion. The top bolt hole needs to be countersunk with a 3/8" inch drill bit to make the bolt be flat on the ring surface. The speaker opening is also not perfectly round. Its actually a bit oval shaped. You will need to insert the bottom tabs first, then when you install it you will need to apply downward pressure to lineup the top bolt. Using a frequency generator, I confirmed a few things about the OEM HU. 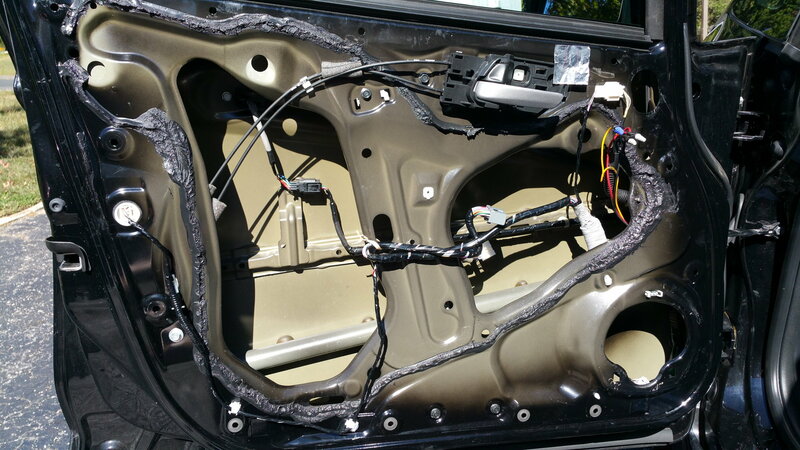 The main purpose was to make sure I had no rattling before replacing the door skins. Be sure to add some foam hind the mount ring to prevent any rattling. 1. There is a HUGE bass rolloff below 100HZ. Its got to be the -3db cuttoff point. The Kenwood speakers are rated to go down to 35HZ, but for a little speaker can't expect much. 2. The 2 way speakers adds for a lot of extra crispy high end to the frequency spectrum. I haven't replaced the tweeters yet with the Kenwoods, but I'd expect a slight augmentation in volume with those over the OEM. Subwoofers will be a perfect addition! After purchasing the LC7i, I'm wondering I should have bought the LCQ1 instead? Having an external EQ to tune the new speakers would be a great feature. Also the external Amp I would use is below. Its rated at 45W/channel, about 73% of the 6.5" speakers program power. Perfectly matched. 28 watts RMS with the OEM HU without any bass pumping through may be adequate to push mids/highs. When I get all the speakers installed I'll make the call to return the LC7i exchanging for the LCQ1 and external amp. Last edited by Bassguitarist1985; 10-07-2015 at 01:34 PM. Bit the bullet and ordered the LCQ1 and the external 4 channel amp from Kenwood. Printed out a return label for the LC7i via Amazon so I'll get fully refunded in a few days. This will give me the fine tuning capability of the door speakers/tweeters along with proper wattage power. Dialing the sub in will also be a huge plus. I got a lot of custom wiring to do! Kenwood KSC-SW11: Running two units with one remote!! Was able to get this to work! I don't know of anyone who has accomplished this. Couldn't find any youtube videos about it. There was a question about this setup on Crutchfield but noone recommended it. Kenwood CS said it would work but not recommended. Didn't see the risk since there are no high power circuits on a tiny RJ12 wire. Ya know for compact subs they are pretty decent! They have decent SPL down to 40HZ from my ears judgement. At 70HZ these things are pretty damn loud! 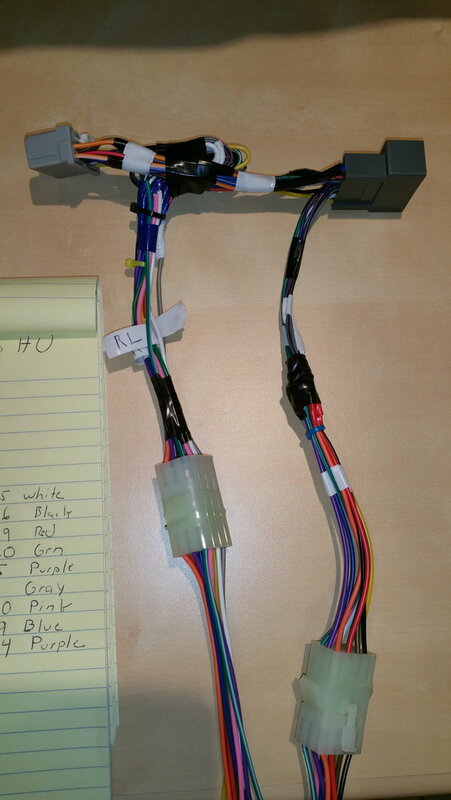 Completed the wiring harness interface so I do not have to cut into the OEM harness. I added the extra pins to retain the steering wheel controls, and added molex connectors so I can interface my external LCQ-1 and Kenwood 4 channel amplifier. This also leaves me the option to use the stock HU's built in amplifier if I needed to. One thing to note. I spliced the 9th pin of the molex onto A24 which is the ACC signal voltage. Ill use this to remote turn on the processor, amplifier and subwoofers all at once. That way when the head unit is on, so are the components. Some pictures for now. A video overview will be soon to follow. Should have the amp and processor by this week. I still need to install the tweeters and subs. I will need to run a single 8AWG wire from the battery for the processor/4 channel amp, and the dual subwoofers. 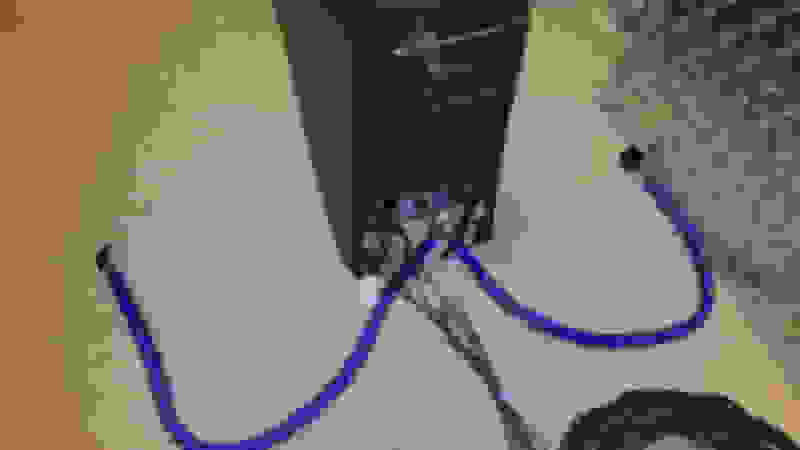 The other option is to run two separate 10AWG wires, depending on whats easier I'll update the thread. Now the fun install stuff starts! Final interface harness created with wire pin out. 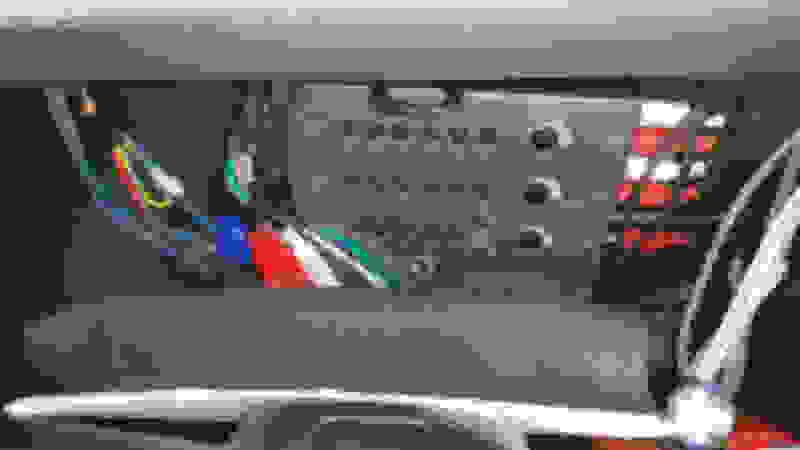 Last edited by Bassguitarist1985; 10-05-2015 at 12:10 AM. Tested the processor and amp today! 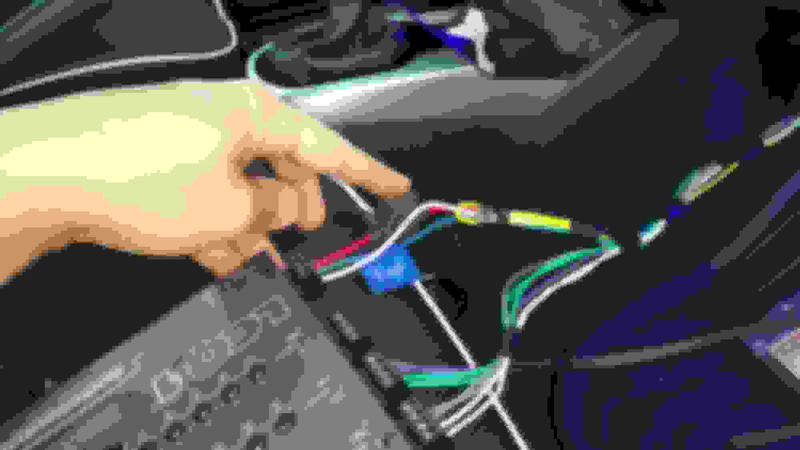 Got the custom interconnect harness installed and the top half of the dash reassembled! Everything works! ***Words of wisdom. That 3rd mounting screw for the HU be careful you dont drop that fucker in the center channel when reinstalling, or worse into the floor air vent chamber. It dropped in there and thankfully its magnetic and used a thin pole magnet to fish it out. Added an hour to my work today! Damnit! WOW! What a difference in sound! The OEM head unit really has no balls at all. That tiny Kenwood amp really can drive the door speakers well! Even the stock tweeters sound crisp! Debating if I even need to change them out at all with the Kenwoods! Still need to run a fused wire from the battery through the firewall to power all the components now. The remote signal circuit I built into the interconnect harness works flawlessly. 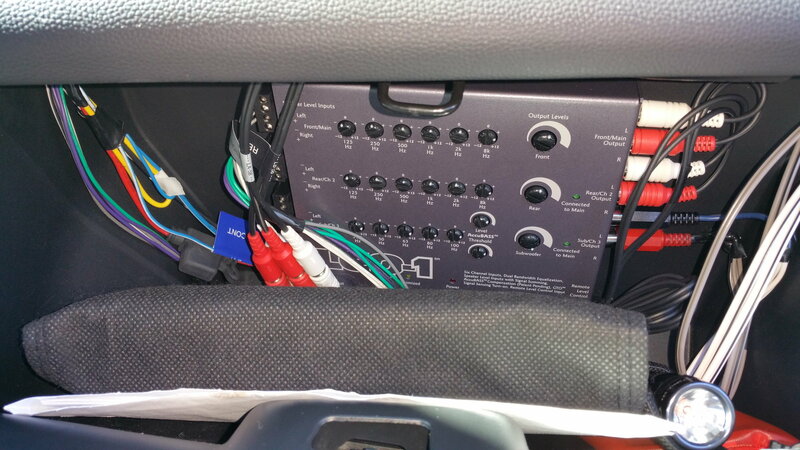 I removed the center console to make it easier to route the wires for the subs. Also took the opportunity to resecure my heated seat wires and relays underneath it with some quality 3M duct tape. Some pics. Ill take more of the glovebox area once components are mounted. Some basic staging for now, but in the home stretch! Last edited by Bassguitarist1985; 10-09-2015 at 11:37 PM. Tucked away between the rails out of the way of any components. Last edited by Bassguitarist1985; 10-19-2015 at 11:45 AM. 99.9% finished the install today. Subs are in, and let me tell you the double ksc-sw11s really do add that missing 1/3 of the sound. The LCQ-1 gives me the flexibility in the tuning of the system to awesomeness. I havent changed out the stock tweeters yet, but will replace with the kenwood tweeters in the next post. The stock ones do audibly distort at higher levels, their wattage rating must be lower than the kenwoods. Also the kenwood 4 channel amp...its a powerful amp, but being a Class D amp, and its price point, the low pass filter of the amp is not the greatest. You can hear a bit of low level switching white noise when no audio signal is present which is typical of budget amps. 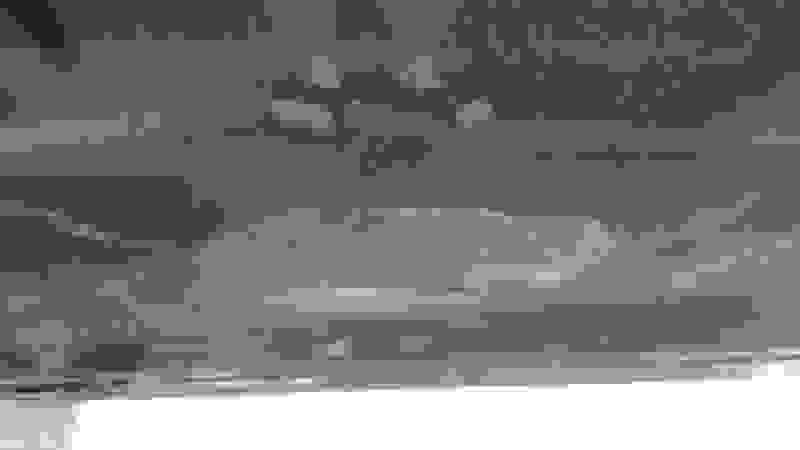 Its especially noticable with higher gain settings of the LCQ-1. The LCQ-1 is amazing. Very high quality and idiot friendly. Highly recommended. Pics in the next post, but so glad to be finished with the project so I can enjoy my tunes in high fidelity! Pics of final setup. Still haven't put in kenwood tweeters yet. Stock ones sound pretty good to me. I still will eventually install them, but not mission critical at this time for me. Put some industrial strength velcro to hold the remote and subs to the rubber mats. I rarely have anyone in my rear seats so I elected to leave them partially exposed. For those who want to hide them under the front seats there is plenty of room to do so! Took me 2 days of driving and tuning the LCQ-1 but wow this sounds amazing. I can now dial in the sub and overall volume to balance the two together. If anything this system shows the limitations of lower quality streaming music. The compression and lack of extreme bass and treble frequencies is much more pronounced. One EQ setting doesn't work for all music. Having two independent volumes (master volume and sub volume) allows me to compensate for what I'm listening to. The glovebox is a bit crowded with the LCQ-1 in there, but I don't keep much in there anyway. 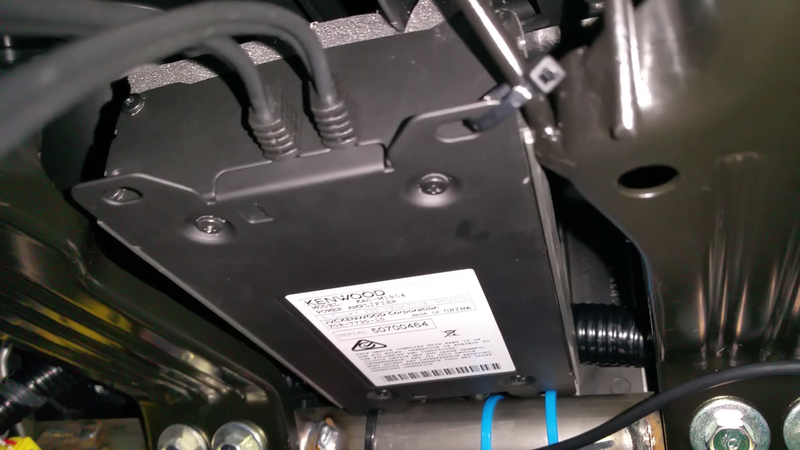 The glovebox itself has cut out slits on each side to snake the wires through. The 4 channel amp sits right above it and no clearance or space issues! I didn't take a photo, but some black wire sheath on the right side of the passenger seat which hides the subwoofer wire feeds which head to behind the glovebox. Very inconspicuous! Last edited by Bassguitarist1985; 10-19-2015 at 11:46 AM. Thank you very much! 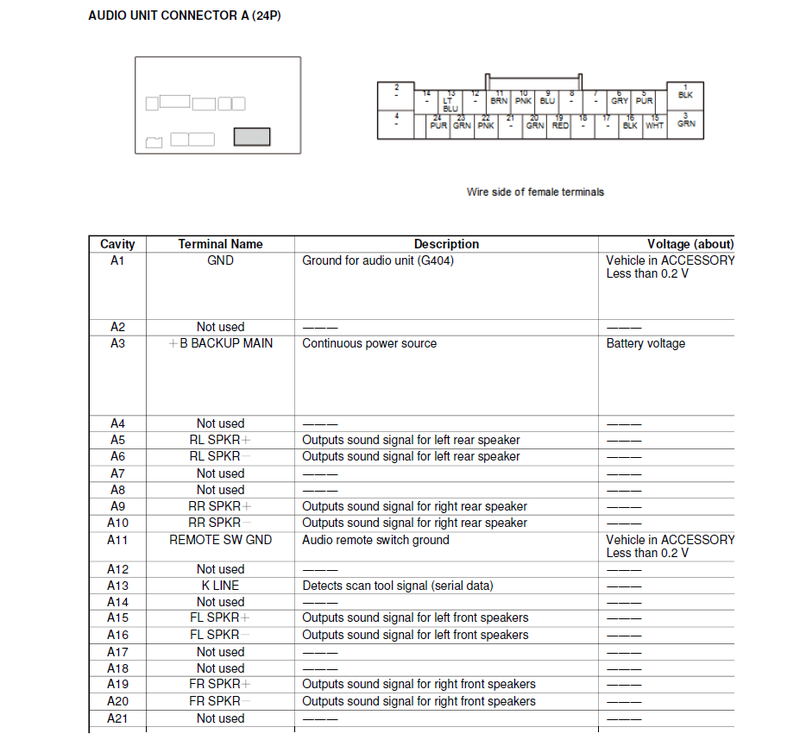 The only document I wasn't able to upload is the pinout diagram and legend of what each pin on the harness goes to, but have included it below for future reference of all. In my video above around 3:25 I clarify how you view this diagram when looking at the aftermarket connectors. ROTTBOY, can you sticky this for us? Last edited by Bassguitarist1985; 10-29-2015 at 11:36 AM. I'll need to add A11, A13, A23, and A24. On the Metra 70-1729, I will have some wires not used (e.g. A3) that I can fold back to stiffen the harness, or snip. The Metra 71-1729 is fully populated, so make it "conform" with the pinout above (and fold back/snip). I won't be expanding above what I'm doing (adding a powered sub). This will allow me to tap the speakers from the new harness, and keep the steering controls of the LX functional? Also, forget the color coding, just mark the leads as to the function illustrated above? Actually, A22 and A23; looks like A24 it there. Yes to all you mentioned. A11, A13, A22, and A23 are for the steering wheel controls. These are the pins you need to add to the male Metra harness 70-1729. You will have wires that are not used on that harness that you can remove and reinsert into a utilized pin location. I would highly recommend using an LOC that has a bass compensation circuit like the LC2i. Without it you will not get any decent output with the sub. The HU attenuates the low frequencies to prevent the OEM speakers from distorting. If you only plan adding the extra powered subs this interface will do the job nicely. If you go the entire system upgrade like me then go with an LCQ-1. Glad my posts helped. Let me know if I can be of further help. Already have the LC2i. I like that fact that it simplifies the install as it/the sub won't require a remote wire. Audio Control really should be paying you royalties! Haha I wish! The remote sense is via the speaker signal input. The HU amp is always active even if the HU audio is "off." Its how the HU is designed. Thus the LC2i is always on when the car is running. 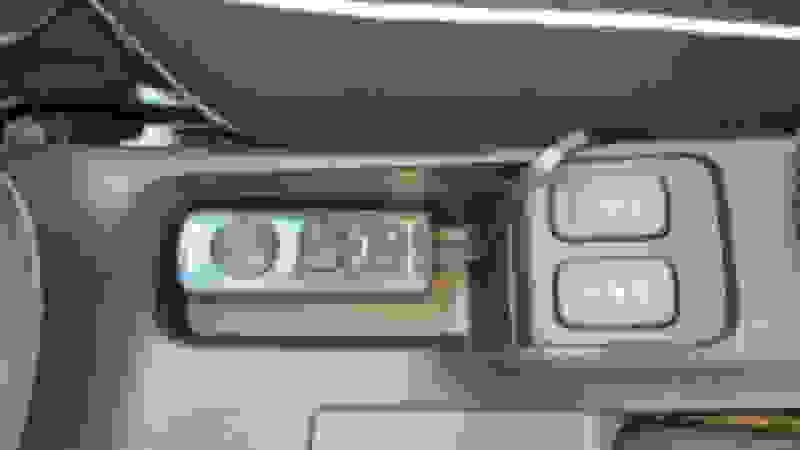 If you jumpered the LC2i for remote sense turn on, or triggered using A24 accessory ignition on power the function is still the same. Bottom line, the LC2i wont drain the battery when the car is off. You will need to trigger the sub via the remote out though to power it up. My setup I misspoke in my video. I have the remote sense on, and channel 3 is NOT summed to the main fronts. I use the remote out to trigger the 4 channel amp and both subs to turn on. I still have the acc power to remote in connected, but function is still the same with sense enabled or remote in as mentioned.